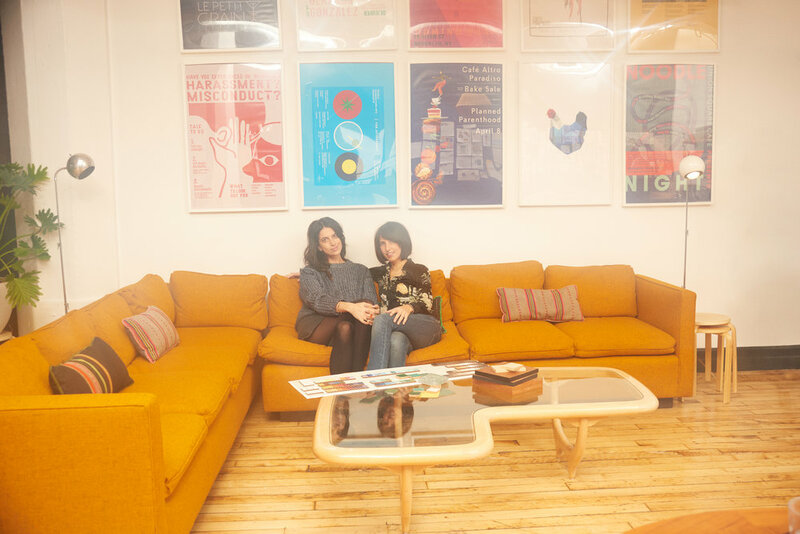 Together, Amy Morris and Anna Polonsky run The MP Shift, a concept, design, and branding studio based in New York. Specializing in hospitality and lifestyle, the duo is the force behind some of New York’s dreamiest restaurants and all-day cafes, including Lalito, Kish-Kash, Otway, and the since-closed De Maria, for which they received the James Beard Award for Outstanding Restaurant Design in 2018. Given their recent achievements, it may come as no surprise that Amy and Anna are expanding, with major projects throughout the U.S. and in Europe, brand new digs in Brooklyn, and a growing staff. We visited Amy and Anna at the office one recent sunny, December morning to talk growth, projects, partnership, and food — including the low-down on the best restaurants to visit in New York right now. How did the idea for The MP Shift develop? I’d love to know more about how it all got started. [We] both had a foot in marketing strategy and design. Amy was a creative director and brand strategist for major media brands — from Condé Nast to Richard Branson to 1stDibs — and also had an interior design business in parallel. Anna was a partner in Le Fooding, the France-born disruptive food media and events company, and was working with international chefs and brands like LVMH and San Pellegrino, helping with brand strategy and creative direction. As we were both focused on new professional adventures, looking to engage on projects that inspired us and allowed us to be more creative, we realized our experience, skills, and centers of interest were so complementary that we could create the first 360-degrees agency in hospitality — from concept to launch, graphics to interiors. We have both found that when you ask a chef or restaurant owner to tell you about their brand, it's usually just a seed (“latin food,” “wine spot”) and rarely fully formed. We realized there was a real need for a holistic and rational approach to developing that seed of an idea, as it impacts all aspects of business. Regardless of the client’s primary need — interior design, website, marketing strategy — we always start by refining their concept and messaging so all else can align. The MP Shift develops that seed into a verbal and visual concept, then designs the brand identity and interiors. Then it’s a much smoother transition to communicate and activate the space, and the story will grow organically and cohesively. What does a day at The MP Shift typically look like for each of you? Every day is different but we’re usually booked from 9:30 a.m. to 6 p.m. with meetings: presenting to clients, working with the team on creative direction, auditing industry benchmarks, site visits to spaces under construction. If we’re lucky we’ll get an hour at The Strand to pour over endless inspiration. Any upcoming projects you’re excited about and would like to share? We have four interior design projects launching in the spring. Two of them are in London: a wine bar for Lyle’s, which was recently recognized as one of The World’s 50 Best Restaurants; and an Indian restaurant in Mayfair, which will bring new Indian flavors to Londoners. London has been a growing market for us; we are also creative directors, in partnership with DesignLSM, for the food and beverage design of an innovative new high-rise at the city center. In New York we are excited to see Three Owls Market open in the West Village. It’s around the corner from The Whitney Museum and will feel like [the kind of] purveyor you find in a European neighborhood; fresh prepared foods during the day and delicious wines and bites at night. Finally, we’re working with sweetgreen on their first ever Texas location. It’s really fun to collaborate with this established brand we all love, especially after we just finished consulting on another Houston place, Vibrant (just awarded Most Gorgeous Restaurant of the Year by Eater Houston). You’re co-founders and good friends: What advice would you give other women collaborating with friends and trying to balance business and friendship? It’s important to outline your goals and the roles you want to take on. Try to image all the scenarios of growth and how you would want your partnership to evolve. The more you communicate the better. 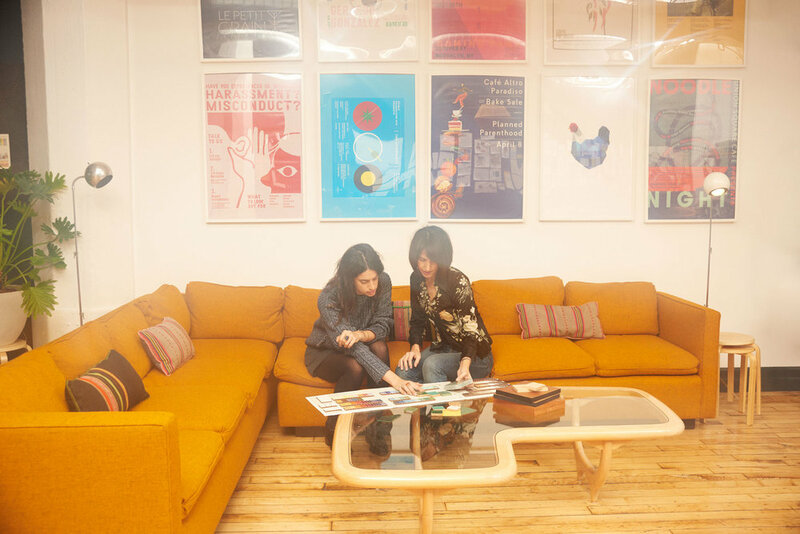 You have a new office in Dumbo, and — no surprise here — it’s beautifully designed. Could you tell us a bit about the look you decided to go for, and the inspiration behind it? The office was a collaboration with the team. We wanted to make sure it felt like a home away from home. A place you feel relaxed and creative. We’re still new to the space so it’s evolving, but it definitely has a Bauhaus vibe. You’ve both developed an impressive network of chefs and restaurants in New York and beyond. What are your favorite places to eat right now? Flora Bar: It’s nearly impossible to get into Estella, but Flora Bar, their sister restaurant with a focus on seafood at The Met Breuer, is just as good — a must try. Karasu: A speakeasy in Fort Greene, they have a small menu but the fish and steak are excellent. We love the design here as well. Atoboy: The service is some of the best in the city and you can’t beat a $40 menu with ingredients that are thoughtful and flavorful. Russ & Daughters Cafe: A true reference in both the food and visual identity worlds, it’s an incredibly well-done evolution of the iconic Russ & Daughters delicatessen that’s been in New York for 100 years. The cafe serves the best smoked fish in town, delicious latkes, and a halvah sundae not to be missed. As Nigella Lawson has said, “The act of cooking for yourself is in itself a supremely positive act, an act of kindness." We couldn’t agree more. What do you like to cook for yourself at home, when you have the time? Amy: My husband does most of the cooking and right now he is cooking every recipe in Diana Henry’s Simple. I love to bake; it’s meditative. Once a month I make a batch of cookie dough and keep it in the fridge for when friends visit. Freshly baked cookies also make a night at home special — gives new meaning to Netflix and chill. Anna: My husband is a chef and always makes fun of my crazy weekend recipe projects; an old school French dish (pissaladière, potatoes Anna), an iconic restaurant recipe (River Cafe’s veal poached in milk, Estela’s endive salad). Sure I can improvise a meal on weeknights, but if I have time, I love the whole ritual of selecting my next project, grocery shopping, following each step, fine tuning… creative, exciting, and relaxing! Es Devlin for creative exploration; Michelle Obama for her grace and fortitude; Ilse Crawford for her pioneering drive.